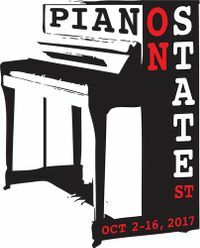 Pianos on State is an interactive musical experience that takes place during Arts and Humanities Month in October. The ninth annual installment will take place October 2nd- 24th of 2018 for the longest run of Pianos on State to date! Each piano becomes its own piece of art as local Santa Barbara artists create individual looks. Pianos will be available for musical exploration, impromptu play, and group performances morning, afternoon, and evening (10am-10pm per piano). Amateur, professionals, and public musicians alike are invited to sit down and play!